Aside from the highly-anticipated Olympic-edition of the Jordan CP3.VI, the much-improved edition of Carmelo Anthony’s eighth signature shoe is also set to have a share of the spotlight. The slimmed-down edition of the Jordan Melo M8, dubbed as the Jordan Melo M8 Advance, is now available in its “USA” edition, which was the same kick worn by Anthony during their gold-medal match in the 2012 London Olympics men’s basketball against Spain. The silhouette features a white-dominated upper part with midnight navy and gym red accents throughout the shoe, reminiscent of Team USA’s colors. This one really looks promising so make sure to get your own pair now! 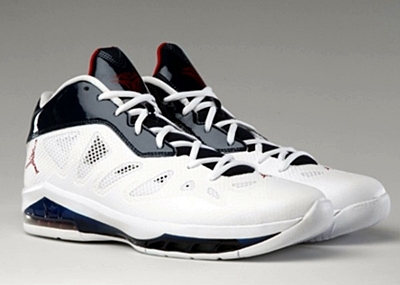 Jordan Melo M7 Advance Coming Out This Weekend! “Knicks” Edition of Jordan Melo M7 Advance Now Out!